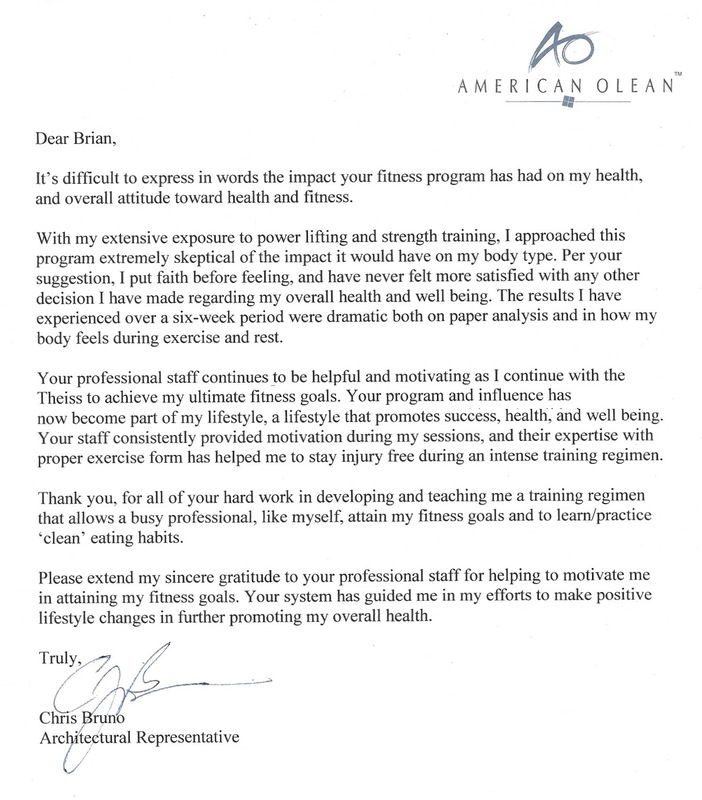 It’s difficult to express in words the impact your online fitness program has had on my health, and overall attitude toward health and fitness. With my extensive exposure to power lifting and strength training, I approached this training program extremely skeptical of the impact it would have on my body type. Per your suggestion, I put faith before feeling, and have never felt more satisfied with any other decision I have made regarding my overall health and well being. The results I have experienced over a six-week period were dramatic both on paper analysis and in how my body feels during exercise and rest. Your professional staff continues to be helpful and motivating as I continue with TheissCare to achieve my ultimate fitness goals. Your training program and influence has now become part of my lifestyle, a lifestyle that promotes success, health; and well being. Your staff consistently provided motivation during my training sessions, and their expertise with proper exercise form has helped me to stay injury free during an intense training regimen. Thank you, for all of your hard work in developing and teaching me a training regimen that allows a busy professional, like myself, attain my fitness goals and to learn/practice `clean’ eating habits. 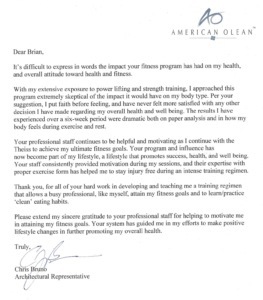 Please extend my sincere gratitude to your professional staff for helping to motivate me in attaining my fitness goals. Your system has guided me in my efforts to make positive lifestyle changes in further promoting my overall health.